*The shipping time can vary +/- 7 working days depending on our warehouse orders´s workflow. See T C.
The Acapulco chair of steel and plastic rod is handmade. This recognized and applauded chair, first produced in the 50s, in addition to its originality also stands out for its comfort. Perfect for indoor and outdoor use, its oval plastic cane seat is flexible to bring you great convenience. Its steel legs are firm and stable. 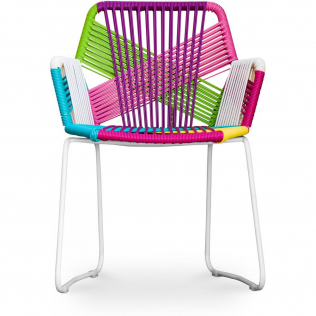 Choose from a wide range of vibrant colors and brighten up your interior design with the legendary Acapulco chair. Today, does it again with this Acapulco Chair - Black Legs.We are helping to bring you design products that cannot be found elsewhere at cost prices directly from factories in Asia. Our team is always on the lookout for unique, top quality products and we are stepping up our efforts to bring you choice and quality at cost prices, products that will charm you with their design, their originality and their price! PrivateFloor is the first website of direct factory sales and good deals at factory price. Cheap and stylish furniture, sofas at factory price, decoration, lamps and fireplaces. and a FREE 10€* voucher off your first order. Due to the new General Data Protection Regulation you must agree on our terms and conditions of sale if you do not want us to disable your account. I agree on the terms and conditions of sale. Are you sure you want to disable your account as of May 25, 2018?